Well things can always be worse. But they can always be better! 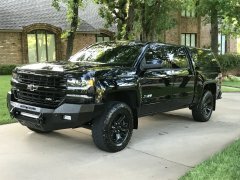 I had a similar issue on my 2007 Silverado many years ago. It would many times not start, sometimes die while driving, sometimes the dash would light up like a Christmas tree (stabilitrack, traction control, ABS, etc.) I found that if I would wiggle the battery cables it would usually start, at least. Under warranty, I had the GM dealer look at this 3 or 4 times, one time dying on the service bay floor, could not duplicate. After that last time, it magically healed. I'm convinced it was a bad connection at the battery, or a bad connection down deeper. I don't know exactly what fixed it, but I would start by making damn sure you've got solid connections everywhere. I don't think this worked with my S7 Edge, unless it was plugged in. Just picked up a S10 over the weekend, will have to try this out. Would be handy. It's too bad the OP's employer doesn't have a sign that says "No breaking into vehicles on company property" hanging somewhere. Would have stopped the thief for sure. Every so often, I joke with my wife about getting a topper (that's what we call them in the US-Midwest). She is very against it for some reason. She thinks I'm way too young for something like that. Whatever that means. I won't jump your crap for not measuring/checking the truck length in hte first place. That's been done enough. I feel like my dealer had some sort of 24 hour or 5 day period for things like this. I would think most dealers would be a little understanding, especially if you're talking about getting another vehicle from them. It's not like you're wanting to return this and just walk away. 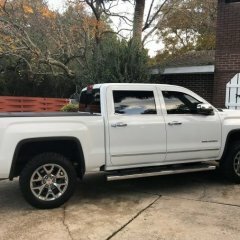 My experience with GM is that they aren't great on covering stuff under warranty either. I understand that they don't make money if they pay for parts, but I'd be steamed too. At least it sounds like it was a cheap fix? I've never really thought about it. Now that you mention it, I feel like it takes a little effort to pull them open, but nothing that's ever annoyed me. And I'm annoyed by LOTS of things in this world. I think I prefer the drawer openings/closings on the Husky over that of my older Craftsman box. There's no resistance whatsoever either way, and it seems odd. Do you hate the shift buttons on column shifter? This is a neat idea. My wife's Enclave has the console shift and sometimes I'll drive it "manually" just for kicks. I have the 41" Husky Combo chest, for 2.5 or 3 years now. https://www.homedepot.com/p/Husky-41-in-16-Drawer-Tool-Chest-and-Cabinet-Combo-Black-VRC-4116BK/303499569 It's awesome. Way better than the 26" Craftsman it replaced. Well . . . supplemented. I agree that the short drawers are nice. But I really dig the deep drawers on the bottom. I have circular saws, belt sanders, things like that in them. They had a wider one, but I had a specific spot this thing was going, so I was limited. I'm impressed with the build quality. The steel is heavy, the drawers slide well. Casters are pretty heavy duty. It's not a Snap On or Matco or anything like that. But For the $500 I paid, I'm very happy. I love my Chevy and dislike the Tundras. Mainly because how different they are. If you are used to your Tundra and like it, I think it'd be really hard to switch. That is one ugly truck. I get that the big ugly grills are the new trend on HD trucks, but . . . I think the OP needs more serious things to worry about in his life than a 1 psi drop in tire pressure. I don't buy the Nitrogen being much better than regular air either. Though I will say, I bought this truck in April 2017, and I think just now added air a few weeks ago. Didn't touch it last winter, and we had some cold days.